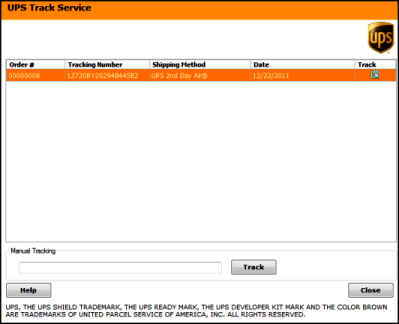 To track shipments using UPS Direct, go to Shipping >> UPS >> Track Shipments to be able to track shipments as per the screen shown. Alternatively you can also double click on any order and click on 'Track'. Both these ways will show you the screen below, from where you can track orders. You can also Manually track shipments by typing in the tracking id into the Manual Tracking field and clicking on 'Track'.